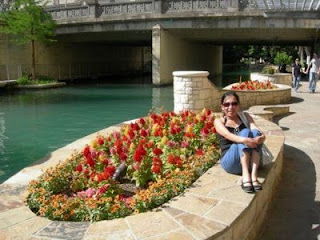 Amidst the scorching heat in San Antonio that day, few minutes after we arrived from the airport, we thought of going for a walk along the River. The place was just one block away from our hotel so that was a good chance. 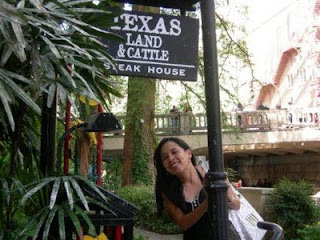 While cruising along the river, we decided to drop by at the Texas Land & Cattle Steak House for a late lunch. Thank God! ...that was a good lunch. Both full and popping! River Walk offers plenty of entertaining options. 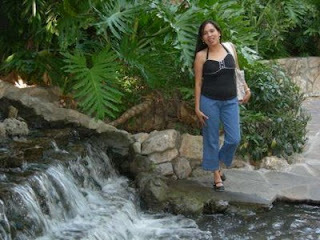 As you walk along, both sides of the river is filled with a lot of dining and shopping outlets. 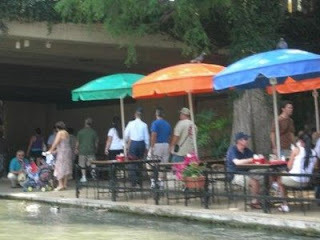 Sidewalks are lined with tables and umbrellas that’s often one of the symbolic tradition of good food and dining at the river . There is one part wherein a stone-arched footbridge crossing the river can be seen and it’s one of the ways to cross the river on the other side. 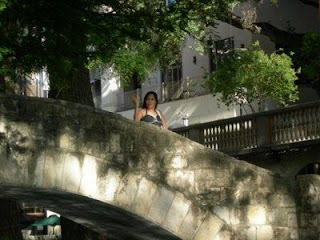 Actress/singer Jennifer Lopez stood on this very bridge in the 1997 movie, Selena. 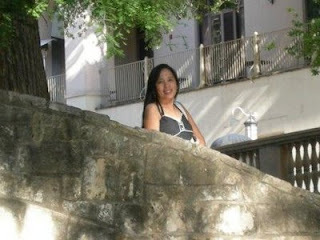 Below are the photos of me on the bridge...feeling like J Lo! LOL!